Its simple design and new frosted display blend into the background. And you can change the temperature from anywhere – the beach, the office or your bed. Energy History: Check the Nest app to see how much energy you use and why. These are in identical condition to any nest thermostat bought directly from Nest or Amazon, and the screen protector has never been removed. The base that attaches to the wall. Trending at $159.99eBay determines this price through a machine learned model of the product's sale prices within the last 90 days. Trending at $122.98eBay determines this price through a machine learned model of the product's sale prices within the last 90 days. 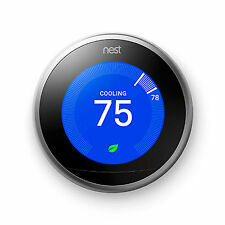 The Nest Learning Thermostat is the first thermostat to get ENERGY STAR Certified by the EPA. Within a week the Nest thermostat starts programming itself to the temperatures you like. Farsight illuminates the thermostat's display when it spots you across the room. TRANE Tzone950ac52zaa Acculink Thermostat with mounting plate as pictured. Great condition used Trane XL950 digital thermostat. The screen is clean with no scratches or defects and has been thoroughly tested for functionality. 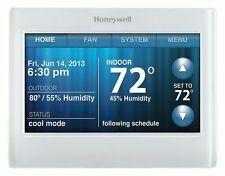 New Honeywell RTH8580WF WiFi Touchscreen Thermostat. 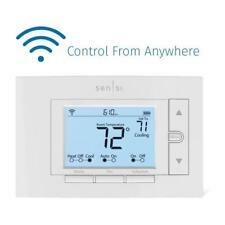 Wi-Fi enabled thermostat allows for remote access via smartphone or computer. Thermostat Product Type. Thermostat Shape. Thermostat Type. Heating and Cooling. Electrical Connections: Honeywell UWP Mounting System. Push-button programmable. Honeywell Standard Installation Adapter (J-box adapter). Honeywell Decorative Cover Plate – Small; size 4-49/64 in = 121mm. Going on vacation?. The Vine Model-610 thermostat is more than just a thermostat. SIMPLE INSTALLATION Compatible with most HVAC models, It includes necessary hardware and detailed instructions for easy installation. It is two sensors and NO STANDS. nest thermostat White T200577. Condition is Used. Shipped with USPS Priority Mail Medium Flat Rate Box. Vine TJ-610-B Wi-Fi Programmable Thermostat Smart Thermostat with Touchscreen and Nightlight 2nd Generation. Vine Wi-Fi Programmable Thermostat Smart Thermostat. Programmable LED Nightlight. Familiar UI for Thermostat,App and Web. This item has been fully tested and works great. Trending at $76.48eBay determines this price through a machine learned model of the product's sale prices within the last 90 days. Honeywell RCH9310WF. Programmable Thermostat. User Interface. New Arrivals. read more. OPEN BOX, NEW ITEM. 4 in (10.16 cm). Display Size. 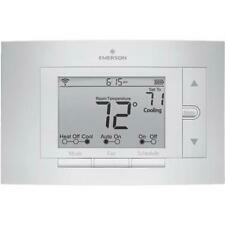 Honeywell T4 Pro Series Programmable Thermostat - White. Condition is New. Shipped with USPS Priority Mail. Nest Pro T3008US Learning 3rd Generation Thermostat - Stainless Steel. Condition is New. Shipped with USPS Priority Mail. Honeywell - RTH9580WF Smart Wi-Fi Thermostat. Condition is Used. Shipped with USPS Priority Mail. 100% working. Selling because im upgrading. 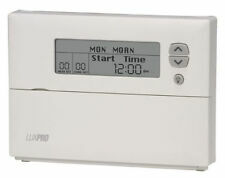 Programmable for annual energy savings. Intuitive programming for easier setup. Trending at $111.49eBay determines this price through a machine learned model of the product's sale prices within the last 90 days. Honeywell Digital Programmable Thermostat. Heating, Cooling and Heat Pump compatible (including auxiliary heat). Trending at $57.60eBay determines this price through a machine learned model of the product's sale prices within the last 90 days. Maximum output load: 1100W(110V). Maximum output load: 1000W(110V);. Buzzer Alarm: High and Low Temperature Alarm. Over-temperature and sensor fault alarm. Sensor Type: NTC sensor (Including). Temperature Resolution: 0.1 ° C / 0.1° F Temperature Accuracy: ±1°C (-50 ~ 70°C) / ±1°F (-50 ~ 160° F). Save even more money as Nest learns your preferences and programs itself to save energy. Nest App Compatibility. 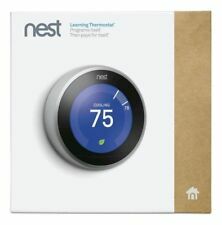 Nest Pro installation card. Each thermostat has been individually tested to verify functionality. Both energy saving features help to reduce your HVAC related energy costs so you can save money without compromising your comfort. If you need anything, we’re here to help. Your experience may vary. Honeywell RCHT 8612WF2005 Lyric T5 Wi-Fi Smart Programmable Thermostat. Auto-change from heat tocool. UWP mounting system. Simple push-button functionality. Model: TH9320WF5003. Honeywell's WiFi 9000 Color Touchscreen Thermostat. Honeywell's Wi-Fi 9000 allows remote access to the thermostat through a computer, tablet, or smart phone with Honeywell's Total Connect Comfort Service. A common wire (c-wire) is required for all system types. If you need anything, we�re here to help. All critical accessories related to the operation of the item will be included. This programmable thermostat utilizes a green backlit touch screen interface with simplified programming and easy to read text instead of complex and difficult to understand symbols. With Auto Change from Heat to Cool, the switch from heating to cooling is automatic. If there are any restrictions to your country it will advise you of that during checkout. We enjoy providing the Midwest with the highest quality auto body products on the market. We are a distributor for 3M, Dewalt, Makita, Milwaukee, Milton, Lisle, Irwin, U-Pol, SEM, GearWrench, Norton, Microflex, Wizard, Evercoat, Forever Black and Tool Aid. Honeywell TH3210D1004 Non-Programmable Digital Thermostat. Condition is New. Installation and instruction booklets included. It is only missing the 2 screws to attach it to the wall which are standard ones with anchors attached and no batteries. Never been used. 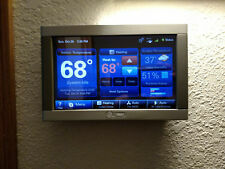 Wi-Fi enabled thermostat allows for remote access via smart-phone or computer. Ability to view local weather from web portal or app. Extra-large backlit touchscreen for increased visibility and ease of use. Equipped with filter change reminder and low battery indicator. Made of high quality material, the thermostat is durable and safe to use. It is easy to install and convenient to use. Besides, it has large LCD display, complete functions and easy operation. Kitchen Tools&Gadgets. The large, lighted LCD screen display is easy to read. The case is designed with fireproof ABS material for human engineering. Temperature sensor is waterproof, high quality, high-accuracy. Large LCD screen ; Glare free and eye protected, Display the sensed temperature, setting temperature, and custom icons on the display indicate working mode. SunStat Command Programmable Radiant Floor Heating Thermostat - NEW!! New and Sealed! NO EXCEPTIONS! make Supersized seem small. 5 out of 5 stars - SunStat Command Programmable Radiant Floor Heating Thermostat - NEW!! 10 product ratings10 product ratings - SunStat Command Programmable Radiant Floor Heating Thermostat - NEW!! Trending at $93.00eBay determines this price through a machine learned model of the product's sale prices within the last 90 days. 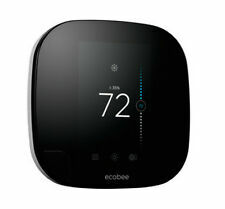 The ecobee smart Wi-Fi thermostat just got even smarter. The new ecobee4 is equipped with Amazon Alexa Voice Service built-in. 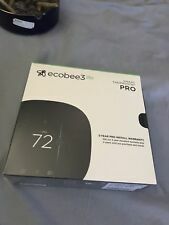 ecobee4 Thermostat. ecobee4 Mounting Plate. Once the product is opened, all warranty and tech support inquires are to be directed to the manufacturer. Serial number has been recorded. Honeywell T6 Pro Programmable Thermostat TH621OU2001. Condition is Used but absolutely no flaws. Was freshly installed by the previous owner before i replaced it with a Google thermostat.